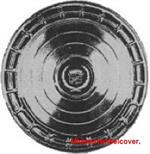 1095, Hubcap used, 15", 80-81, BUICK, ELECTRA, PARK AVE, MULTI RING TYPE, PAINTED. 2035, HUBCAP USED, 15", 80-81, CADILLAC, DEVILLE, CHROME, MULTI RING TYPE, RAISED CENTER, MAROON CENTER, GOLD RINGS,FULL COLORED LOGO, METAL CLIPS. 2035, HUBCAP USED, 15", 80-81, CADILLAC, DEVILLE, CHROME, MULTI RING TYPE, RAISED CENTER & MAROON CENTER GOLD RINGS & FULL COLORED LOGO, METAL CLIPS. 2052, Hubcap used, 14", 88, CADILLAC, DEVILLE, FLEETWOOD, FWD, SLOT TYPE, WITH MULTI-RINGS.